Dustin J. Allen reflects on his participation in the 2019 Balkan Route Tour. He writes about the need to see people as individuals, with their own aspirations, fears and dreams. My tour with Clowns Without Borders USA is all wrapped up. I’m dwelling on the memories of 2,150 audience members, 20 shows in three weeks, and endless hours spent driving through the winding roads of Romania, Bosnia and Herzegovina, and Serbia. 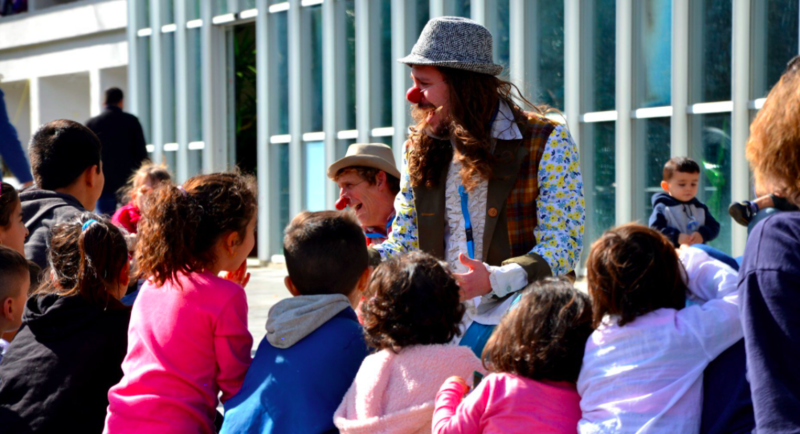 I happened to be with the perfect clowns to guide me through the experience, and feel incredibly fulfilled. But there’s also something heavy. There’re still thousands of people in camps, with no end in sight, and tens of thousands more fleeing war-torn countries, staking their lives for the small chance of freedom. And soon they’ll be placed in these same camps. Each person I met is an individual, not “just” a member of a religious or ethnic group. I want to encourage people to take a step back and reconsider the rhetoric they might have heard about refugees and migrants. We met men, women, and children—doctors, engineers, truck drivers, musicians, barbers, accountants—who wait indefinitely in terrible conditions, who lost homes, careers, families, and friends. Many of them told us that the situation they left, as well as their experience in these camps, is “not life,” or “not living.” The people I talked to told me they want safety for their children, opportunity to grow, learn and succeed, and the peace of mind to leave their home without fear of being killed by extremists or oppressors. This heaviness extends to all marginalized groups we met, not just migrants. Deep in rural Romania, one Roma community we played for faces a plight seemingly grimmer than that of refugees and migrants. They live in a shanty town, up against the constant hatred of their neighbors, denied education and work opportunities. I hope to put the red nose back on and do it again sooner rather than later. Until then, as usual, I have a lot to say. If you want to meet, or just message me to ask about any element of any of this work, let me know.